My recent pregnancy really sucked largely due to one thing: swollen feet. I didn't have that problem when I was pregnant with Roo, but this time my feet and ankles were horribly puffy and misshapen for pretty much the last trimester. And then after Jasper was born, I was put on blood pressure medication that made it even worse. It was really humiliating. I couldn't wear anything on my feet but flip flops or Crocs. In the end, even the Crocs were too snug. Aren't you glad I didn't take any pictures? Anyway, the reason I am writing this is because I have always had a bit of a shoe fetish. It's been torture wearing ugly shoes all summer, especially when it would have been nice to have some pretty things. Well, here are the prettiest shoes I've seen in a long, long time. Prices start at £260. More beautiful styles are available online at Hetty Rose. 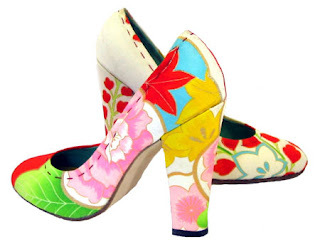 Shoes are handmade to order and take approximately six weeks to cut, stitch and finish. The process includes taking measurements and photos of your feet and then (if you are based in the UK) they do a fitting at a half-way stage. I can't even imagine how fantastic these shoes must feel on. Probably just as good as they look!